I've always been excited about new additions to the Games Workshop paint range, especially when they tie into my army. 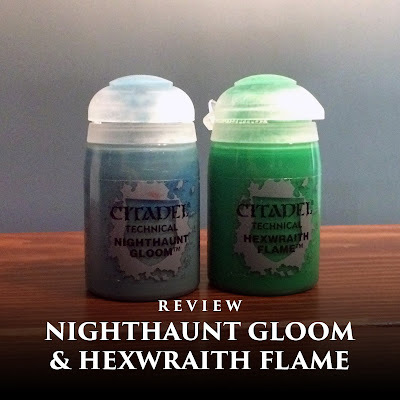 Although my color scheme is set, I knew I wanted to give Hexwraith Flame and Nighthaunt Gloom a spin to see how they worked and have them available for future projects. So, how do they work, and most importantly, how do they compare to the old standby, Nihilahk Oxide? The very first thing you'll notice is that both of these paints come in the taller bottle that the shades and texture paints come in. This is a big plus, and I really wish they would repackage Oxide in the larger size as well. I have gone through several bottles of Oxide since I started my Nighthaunt army, so if you're using these new paints for a Nighthaunt project the larger bottles will be greatly appreciated. Cracking open both of the new paints and Oxide, what we'll refer to as the ghost paints, I painted a little swatch of each onto a piece of white board. In the past I have done swatches like this over black to show how well it covers, but since in most cases you'll be using these over a white basecoat I thought this was more fitting. 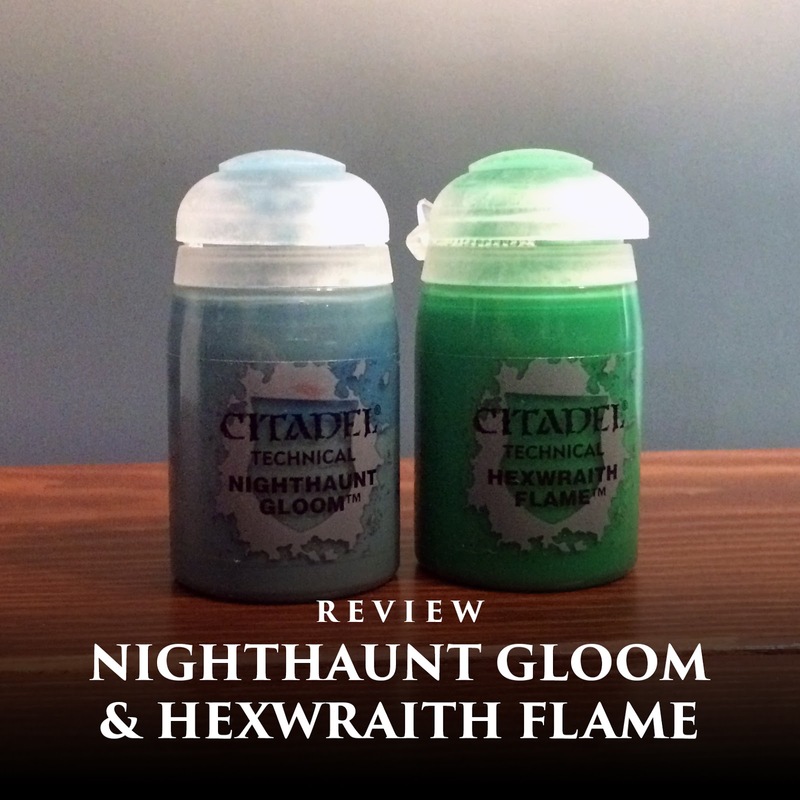 From left to right we have Nihilahk Oxide, Hexwraith Flame, and Nighthaunt Gloom. First impressions are that Oxide and Gloom cover about the same, while Flame is a little more translucent. Generally, with these types of paints you want a bit of translucency though, so for the purposes of painting ghosties I think Hexwraith Flame actually achieves the job the best straight out of the pot. Even though Oxide and Gloom have about the same coverage, I think Gloom will go on with a lot more opaque coverage just due to how much darker it is. The darker the paint is the more prominent it will look over white. The raised surfaces will show through with Oxide more than Gloom. Honestly, I would mix Lahmian Medium into all of these anyway for ghostly purposes. To test it out I decided to paint up a spare Glaivewraith Stalker I had following the video guide from GW's own Chris Peach. So join me in the first (maybe only?) special feature titled "Just Peachy with Mengel Miniatures," where I follow along with Chris' guide and see how it turns out for me. 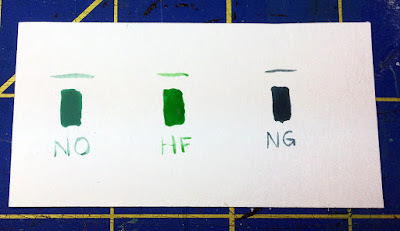 This guide is perfect for testing out these paints since it utilizes both of them! I made a small change right away by mixing in a little Lahmian Medium to my Hexwraith Flame. This allowed it to flow better and not stain the model as much. I definitely didn't have to mix as much of this in as I do with Oxide. 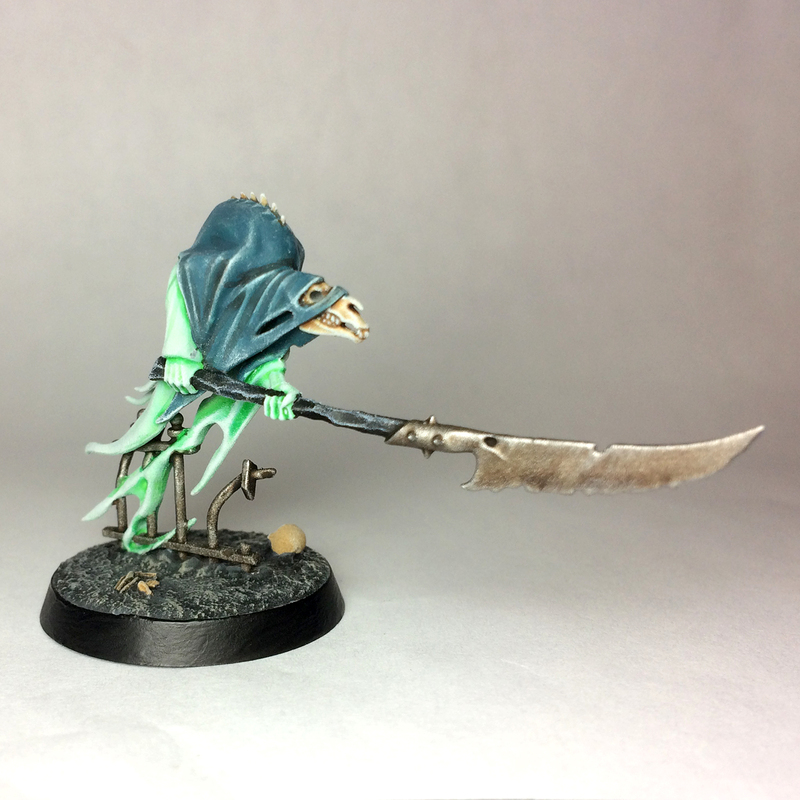 I then followed this up exactly as Chris does in the video, by painting the upper cloth with Nighthaunt Gloom. After two coats of it I had a pretty solid base coat. This just goes to show you how much this darker color covers compared to Oxide. As I continued on I made a few small tweaks to Chris's guide. I really wanted to try out the bone skull look that the studio's army has, so the skull was tidied up with Ulthuan from where I may have gotten the other two colors on it. I then washed that with Seraphim Sepia. There was no wood color in the video, so I chose black. At this point, with all of the robes shaded/basecoated, along with the skull and wood, I drybrushed the whole model with Ulthuan Grey. I did this in the same manner as Chris does, while also being fairly light on the wood and skull as well so as not to overpower those colors. I wanted a little more contrast on the Nighthaunt Gloom cloth, so I painted a little bit of Nuln Oil into some of the folds. I then painted the metal the same way as he did, but finished it off with a drybrush of Necron Compound. 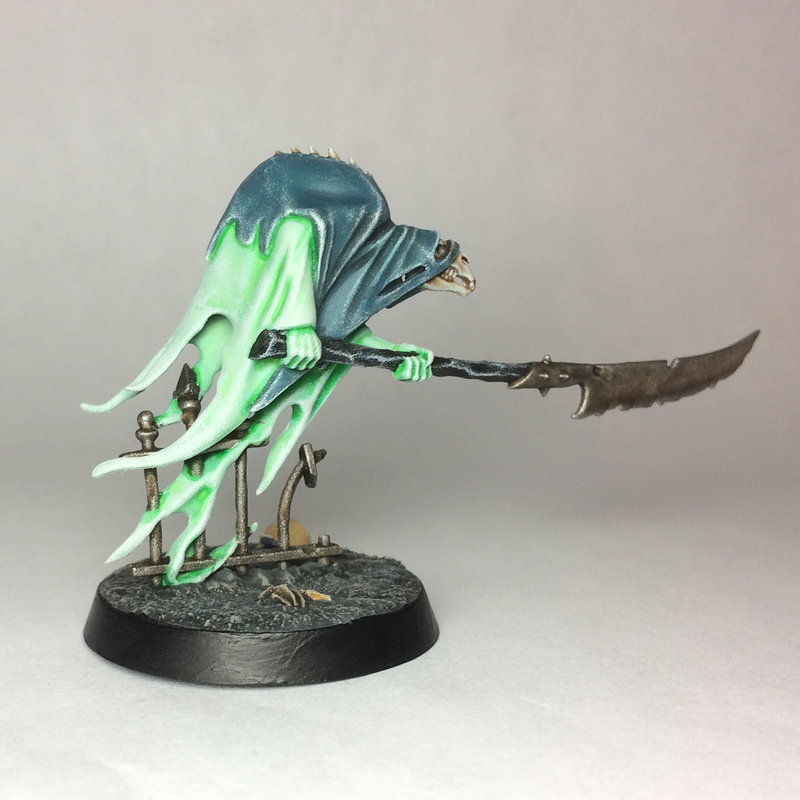 I think using Nighthaunt Glom and Hexwraith Flame in the way that Chris does in the video can get you a really cool looking model in a really short time. Even with the changes I made, the amount of extra time they added probably amounted to maybe five to ten more minutes per model. I think the key to this method is having good control over your drybrushing, so if you're unsure, practice it on a spare model or two. I imagine painting an entire army in this way would both look great, and go fairly quick. I really like the addition of these two new technical paints and I've already started thinking about possible other applications. 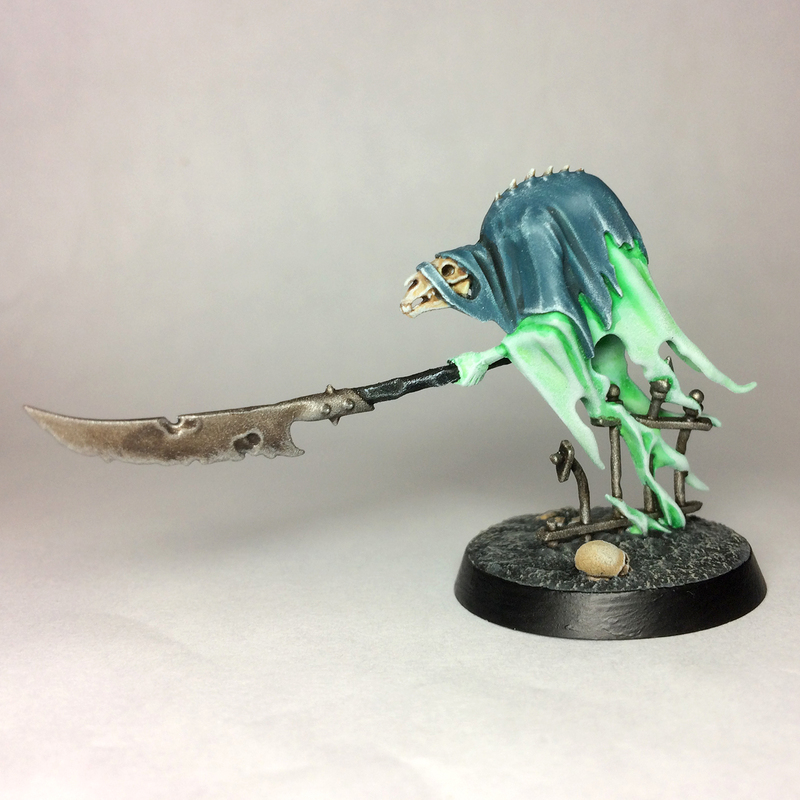 I think the Nighthaunt Gloom would make a really good shade for a lighter blue grey, such as Fenresian Grey. Just mix a little Lahmian Medium in and use it sparingly. I'm curious if there's a good way to use Hexwraith Flame for painting Ork/Orruk skin. Perhaps alongside Biel-tan Green and a Waywatcher Glaze? There's no doubt that Flame would be a great color to paint plasma effects for 40k models as well if you want a green look. 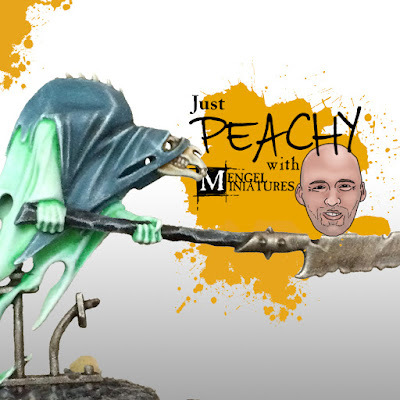 I'd love to see what uses you've come up with for these paints, or even your own applications of this on some of the new Nighthaunt models.